One (1) prize will be awarded each month during the Promotion Period as outlined in Section 5. 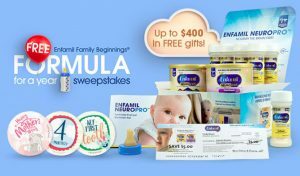 The prize consists of a year’s supply of the winner’s choice of any Enfamil or Enfagrow branded formula. Approximate Verifiable Retail Value (“ARV”) of the prize is: $1,200 U.S. Dollars. The total value of all prizes available to be won during the Promotion Period is $3,600 U.S.